Scope Mount specifically to accommodate mini-red dots from Burris, JP and Trijicon, with the exception of the Trijicon RMR model. Compatible with Mini-14/30 Ranch Rifles only. 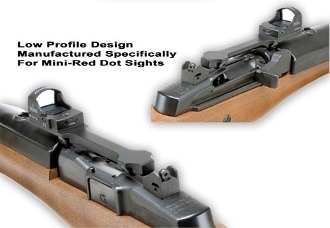 The Ruger Mini- 14/30 Scope Mount is easy to install. Platform will accommodate mini-red dot scopes like the JPoint, Doctor, Burris FastFire’s, Leupold Delta Point, and the Trijicon Red Dot (non-RMR). The Mini-14/30 Ranch Rifle Scope Mount places the mini-red dot forward for quick target acquisition. Relief cut beneath the rail for unimpeded cartridge ejection. Low Profile design keeps optic close to centerline of bore. Can be installed without removing rear iron sight. All edges are smoothed and rounded for shooters comfort and safety.